Yoel Shalit, brother of Gilad, interrupted the official Independence Day ceremony for fallen soldiers. 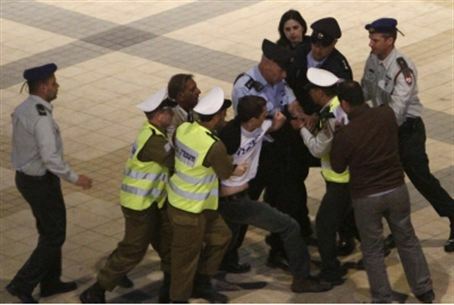 Security men accost Shalit and Vinkler. Meir Indor, chairman of the Almagor terror victims' organization, is vowing to "take off his kid gloves" and fight the family of abducted soldier Gilad Shalit, following a provocation by the Shalits on Independence Day. Yoel Shalit, Gilad's brother, and his girlfriend, Yaara Vinkler, interrupted the traditional torch lighting ceremony at Har Herzl that kicked off the Independence Day celebration, and received extensive air time on the television and radio stations that covered the event. Yoel Shalit held up a sign that said - "my father is a bereaved brother, I do not want to become one too." Indor said that the latest protest by the Shalit family was an act of desecration. "We, the wounded ones, and the bereaved families, also have many complaints about the mistakes that brought about the injury and death of many. Israel's governments released terrorists who then caused the murder of Jews. In the past, we thought several times about protesting during the Remembrance Day for Terror Victims ceremonies, but we preferred to avoid such an act, because in these ceremonies there are lines one should not cross." The highly sympathetic press coverage that the Shalit protest received reflects an ambition on the part of the press to topple the Netanyahu government, Indor said. "We know that Channel 2 equipped the protesters with an open microphone and connected them to the console in advance, We will turn to the Knesset committees and to the Press Council in order to discuss this grave matter. Their broadcast licenses should be revoked." Indor announced his group's intention to renew the protest vigil opposite the Shalits' protest tent in Jerusalem. "This is a political struggle by a well-oiled staff sponsored by leftist elements," he explained. "They have become an existential threat on the State of Israel. If, G-d forbid, the government gives in to them and releases terrorists, we can expect numerous additional cases of bereavement." The Shalits have threatened to take the Netanyahu government to court if the Prime Minister does not immediately pressure the PA to release their son. They turned to Abbas for help now that Fatah has made a unity pact with Hamas, turning freeing Schalit into a test case of Abbas' real intentions.